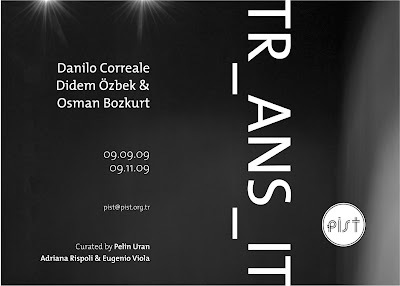 From September 9th to November 9th, 2009 PiST/// Interdisciplinary Project Space presents the exhibition TRANSIT II by Danilo Correale, Didem Ozbek & Osman Bozkurt. TRANSIT II investigates one of the defining issues of today such as amnesia in relation to the recent past and the movement of the immigrant, which according to Homi Bhabha changes the history of a nation. By concentrating on the forgotten history of a small district called Pangalti in Istanbul, Didem Ozbek & Osman Bozkurt implicitly makes the presence of the Italian / European community once visible within the Ottoman Empire and early Republic of Turkey. Danilo Correale, on the other hand, has concentrated his research on the production of handcrafted cymbals in Istanbul which was manufactured by Armenian community since the Ottoman Empire. While The Istanbul Symphony by Danilo Correale will be preformed on September 9th, 2009 at 9.30 pm at PiST///; Grand rue Pancaldi, a daily performance by Didem Ozbek & Osman Bozkurt will take place at NAPOLI Grocery Store until November 9th, 2009. 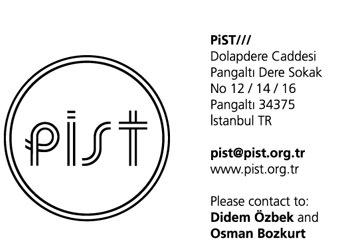 PiST/// thanks to LG Electronics Turkey, Istanbul Agop Cymbals, Italian Workers' Association of Istanbul, and NAPOLI Grocery Store.